Education Qualification : Having PhD Degree in the Field of Economics/Finance or Equivalent from any Reputed University. 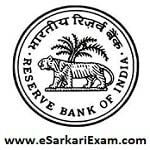 Eligible Candidates can Submit Application at the Official Website of RBI latest by 30th November 2018. Click on Opportunities @ RBI Link. Open Vacancies Link in Current Vacancies Tab. Open Direct Recruitment of PhD's in Grade B Link.